Dog meat is touted as a stamina-boosting dish by some in South Korea, but the first nationwide food safety inspection of the meat has revealed that it is not safe and clean: 64 percent of the dog meat being sold at markets was found to contain some kind of antibiotics, while most have potentially harmful bacteria and viruses. 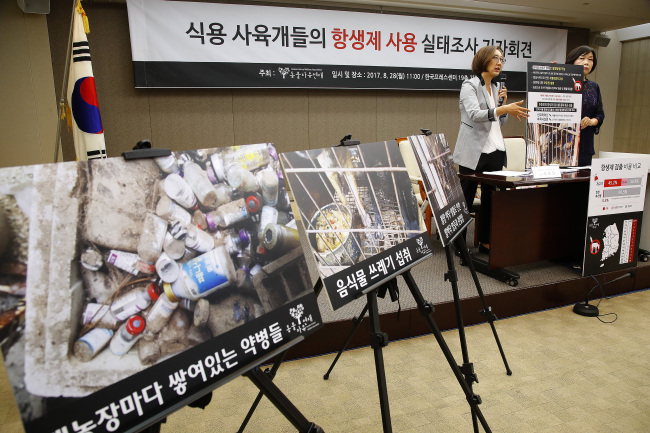 According to Konkuk University’s Institute for the 3Rs and the Korean Animal Welfare Association on Monday, which inspected dog meat from 93 vendors at 25 traditional markets, more than one type of antibiotics were detected in meat from 60 shops. This is up to 490 times higher than the levels seen in other livestock products that are sold at regular grocery stores. Dog meat is processed, distributed and consumed in a legal but unregulated grey market. It can be found only in some traditional markets, including Gyeongdong Market in Seoul, Gupo Market in Busan and Chilseong Market in Daegu. 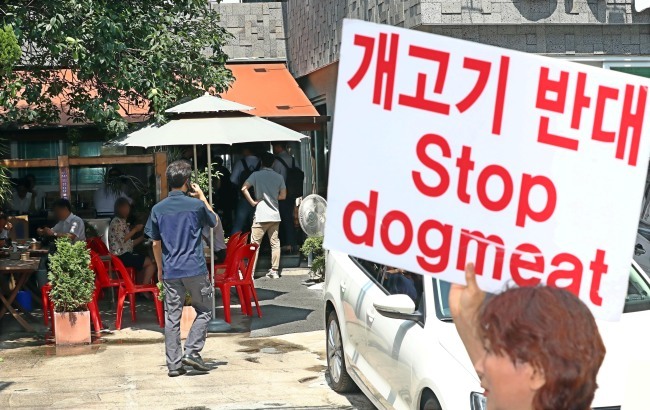 The inspection was conducted from June to August, peak season for dog meat dishes because of boknal, which is when South Koreans eat high-nutrition dishes to prepare themselves for the sweltering summer days. According to the state-led food safety inspection in the fourth quarter of last year, 0.44 percent of beef tested nationwide was detected with traces of antibiotics, while 0.62 percent of pork and 0.13 percent of chicken had such components. All of the dog meat tested was detected with microorganisms, bacteria and viruses of 25 different types, including E.coli. It was the first nationwide sanitary inspection of dog meat. The Livestock Product Sanitary Control Act, which governs the slaughtering, processing, distribution and inspection of livestock products, does not categorize dogs as livestock to be processed as food, making dog meat shops not subject to the mandatory sanitary inspection by the government. However, with no law against the sale and consumption of dog meat, farming, butchery and the consumption of dog meat have continued in a legal gray area. The industry has a history that dates back centuries, but in recent years it has struggled with dwindling demand amid international criticism.